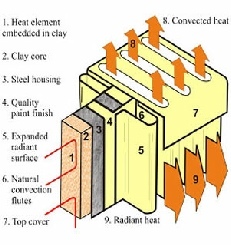 Inside each heater is a series of refractory clay blocks. There are up to twenty Independent blocks in each radiator. Each Block has encased within it an air tight heat element that heats up very quickly, typically in just a few minutes... It then holds on to heat for long periods thereafter. The technology within the radiator for heat conservation and heat distribution capability is incredible and customers report just a cosy, cosy comfort and savings on their fuel bills! 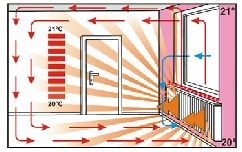 Once the room reaches the desired temperature a thermostat turns the heater off, but the room temperature doesn't plummet like with conventional heating, instead the room remains warm using the stored heat. Because of this storage capability test show the heater might only draw electricity for 15 to 20 minutes per hour depending on the insulation levels in the room. 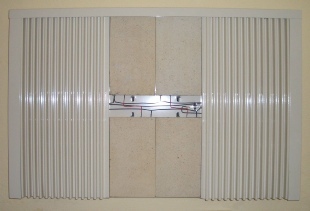 Apart from the unique refractory clay blocks there is another secret to performance of these radiators.... The unique fluted design! The flutes are about an inch deep, far more than conventional radiators, this dramatically increases the surface area. It is said that one foot of these radiators has the equivalent surface area of five feet of a standard radiator So a 3ft long Elti radiator with its huge radiant surface can be compared to fifteen feet of a standard radiator!. Perhaps now you can see why these radiators are so efficient and unique! 1. During the heating cycle some of the heat is stored in preparation for the coming hour. 2. Warmth is supplied to the body of the heater by the clay core and radiated into the room through the expanded surface area provided by the flutes. 4. As the room begins to equalise, there is less cold air at floor level so convection is reduced in favour of the cosier radiant heat.